A police officer was seen stuffing cash into his sock during a raid on a drug suspect. He told prosecutors it was a "joke" when he got caught, and they believed him. Victoria, CA — In a case that proves the notion cops can be seen breaking the law on video and not be charged, a police officer in Victoria was seen taking a suspect’s cash, shoving it into his sock, and he will face no charges. This is in spite of the fact that the department called the officer’s actions “concerning” and the taking of the money wiped away most charges over the raid. According to police, they executed a raid on a resident in November of 2017. It was during this time that the officer was seen on a video recording from the suspect’s home, picking up a wad of cash from the desk and shoving it into his sock. For six months, the officer thought he’d gotten away with it. However, during the trial of suspect Brian MacDonald, defense lawyers produced the hidden camera footage showing the officer’s alleged crimes. 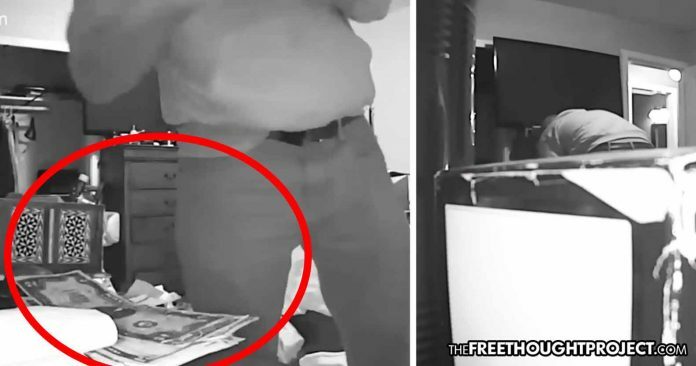 As the video shows, the officer is in the room by himself, as he looks around. When he spots the cash, instead of seizing it in an evidence bag, the cop shoves it in his sock. Now for the most ridiculous part. When confronted by his department, the British Columbia officer said he shoved the cash into his sock as a joke—and they believed him. The department believes the officer because he claims he returned the cash after his “joke” of shoving it into his sock, with no one around to see it. However, there is a major problem with this joke claim as some of the bills shown in the video were never submitted as evidence. According to the BC Prosecution Service, the gaps in the evidence do not provide sufficient proof to raise the allegation of theft. Apparently they watched the video with blindfolds on. As CTV News reports, the service says several factors, including the presence of other possible suspects and an inability to acquire all the video from the scene, mean the evidence can’t support a prosecution. Showing just how unnecessary the raid was, MacDonald was acquitted of all charges in September, except for a single count of possession of a controlled substance. Highlighting the irony of this situation is the fact that the only person held accountable in this incident was a person selling another person a product they voluntarily agreed to purchase. When the alleged “good guys” showed up to prevent any further voluntary transactions, one of them was seen committing an actual crime of property theft and he will not face charges. Sadly, as TFTP reports on a regular basis, this type of incident—including incidents in which cops are seen robbing people on video—is not uncommon. Even when there is overwhelming evidence against the officer, and they are found guilty, rarely do they face any accountability. As TFTP reported last month, officer Linnard R. Crouch was seen on his own body camera—not helping a 74-year-old man who was having a heart attack—but robbing him. The elderly victim, James Mabe had the cash to go buy Christmas presents for his grandchildren, but because the cop robbed him instead of helped him he’d never make it. As we reported on October 4, the officer who stole a dying elderly man’s Christmas money will not be going to jail. Last month, with almost no news coverage, Crouch pleaded guilty to robbing the elderly dying man. Instead of being punished for his utter betrayal of public trust and despicable act, Crouch was given probation and will not spend one day behind bars.